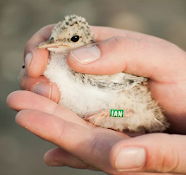 Kilcoole Little Tern Conservation Project: Day One! Myself, Cole & Jason moved the caravans, fence posts & signs down onto the site today. The first set of barriers around the colony, comprising of string fencing & information signs will go up over the next day or two. This will mark out what section of the beach is off-limits and what section of the path is still open to the public. The main fencing around the colony (flexi-net & electric fencing) will be put in place over the next while once we get an idea of where the birds are settling down to nest. Plenty of Little Tern activity at the main colony site with lots of courtship & display flights going on. Quite a bit of dreading was observed too, during which a total of 46 birds were counted (up from 10 birds when I visited the colony on Saturday). The Breaches has been blocked for sometime now and the estuary is full to the brim. As such most of the waders in the area were in Webb's field (NPWS reserve). There was still plenty of them moving through all the same with 22 Whimbrel, 23 Black-tailed Godwits, 3 Bar-tailed Godwits, 18 Dunlin, 16 Turnstones & a Common Sandpiper noted this afternoon. I'm looking forward to seeing how the wader migration pans out over the next 3 weeks or so, let's hope for something good! The only other birds of note were a Swift & a Yellowhammer at the farmyard and a 'winter' plumaged Red-throated Diver seen offshore from the colony. Anyways, it's great to be back. The raucous sound of Little Terns displaying overhead was a welcome sound! I'll post again this weekend/Monday with some pics & an update on how the fencing/setting up process goes.